Police in San Jose are investigating a pellet gun shooting that left one person with a head wound Monday morning. The shooter rifled several shots from an apartment complex in the 1000 block of South Fifth Street around 9 a.m. toward a wholesale produce company across the street, hitting at least one person in the head, San Jose police Lt. Dave Santos said. The injured victim was working when they were hit and subsequently transported to a nearby hospital to be treated for non-life-threatening injuries, Santos said. San Jose resident Jim Foster says that Monday's shooting, along with a recent string of violent crime in his neighborhood, have stirred up a cause for concern. "We just had a double homicide two blocks away last night," he said. "It's a problem." Police do believe that they have a suspect in mind, but Santos said that they do not have anyone in custody. "Right now, we think we've identified the suspect, and we are now following up on that," Santos said. Police walked out of the apartment complex carrying a pellet gun in a box, which they later examined more closely. Police are also unsure if the shooter was specifically targeting anyone. 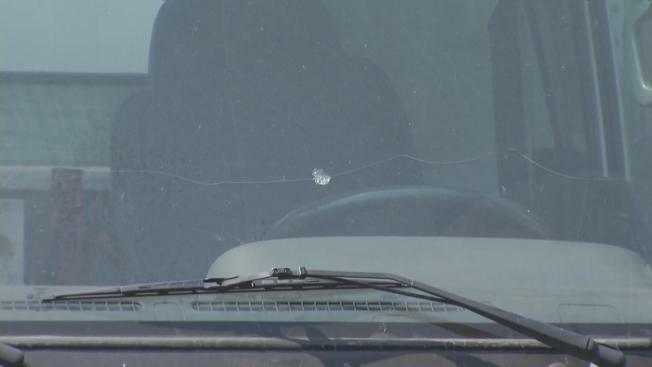 Several cars along the street were also hit during the shooting, resulting in damaged exteriors and broken windows, Santos said. Neighbors said the pellet gun shootings in the area have been going on about a month, and they even reported them to the apartment management. But this was the first time someone was hurt.